Chattanooga Police Officer Rob Simmons patrols Market Street on Wednesday, June 3, 2015 while using a brand-new device attached to his bicycle that measures the distance motorists give when passing. "The operator of a motor vehicle, when overtaking and passing a bicycle proceeding in the same direction on the roadway, shall leave a safe distance between the motor vehicle and the bicycle of not less than three feet (3') and shall maintain the clearance until safely past the overtaken bicycle." 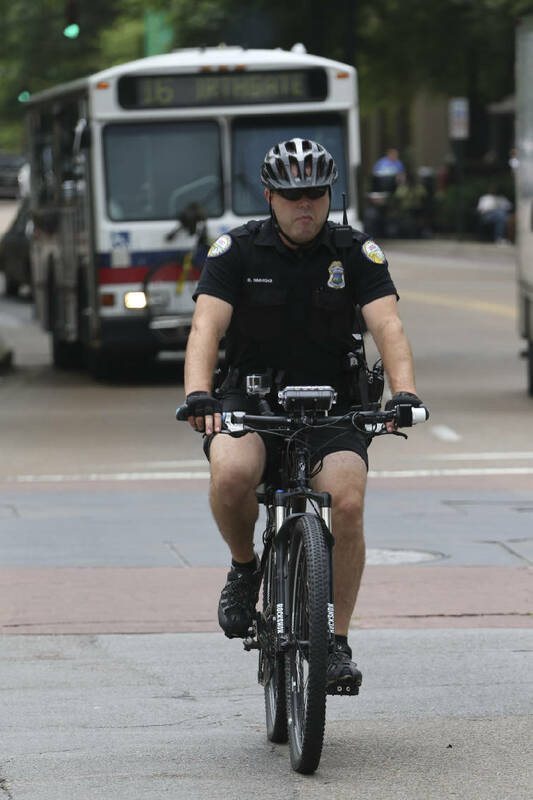 Chattanooga Police Officer Rob Simmons patrols Market Street on June 3, 2015 while using a brand-new device attached to his bicycle that measures the distance motorists give when passing. On a gray day threatening rain, Chattanooga bike patrol officer Rob Simmons pedals north on Market Street, hugging the right side so cars can pass easily. A GoPro camera on his right handlebar captures the scene as Simmons cruises through the Fifth Street intersection near Buehler's Market. Affixed to the center of the handlebar is a square device in a clear plastic case. A green Ford Expedition appears in the lane to his left and overtakes the cyclist. Then, seemingly out of nowhere, a small gray Fiat pulls up alongside Simmons and swerves into the lane ahead of him a little too close for comfort. A blue "34" appears in the display of the encased device. The number doesn't indicate the Fiat's speed, but rather the distance in inches it was from Simmons when it passed him. Whether the motorist knows it or not, he's just broken the law. Simmons pedals hard and catches the Fiat a few blocks ahead at a stoplight. He pulls up alongside the car, tells the confused driver to remain stopped, and identifies himself. "What happened?" the driver asks. "I'll explain to you in just a second," Simmons says. This is what Simmons wants. The teachable moment. Laws in Tennessee and more than 20 other states require motorists to give cyclists no less than 36 inches of clearance when passing. Simmons says most people he stops have never heard of the "three-foot law." That's why, instead of handing unwitting offenders a ticket, he hands them a pamphlet. "The goal is not to write tickets," Simmons says. "The goal is to educate motorists." Simmons says the device on his handlebars, called "BSMART," has opened up a whole new way of enforcing a law that used to be the officer's word against the violator's. 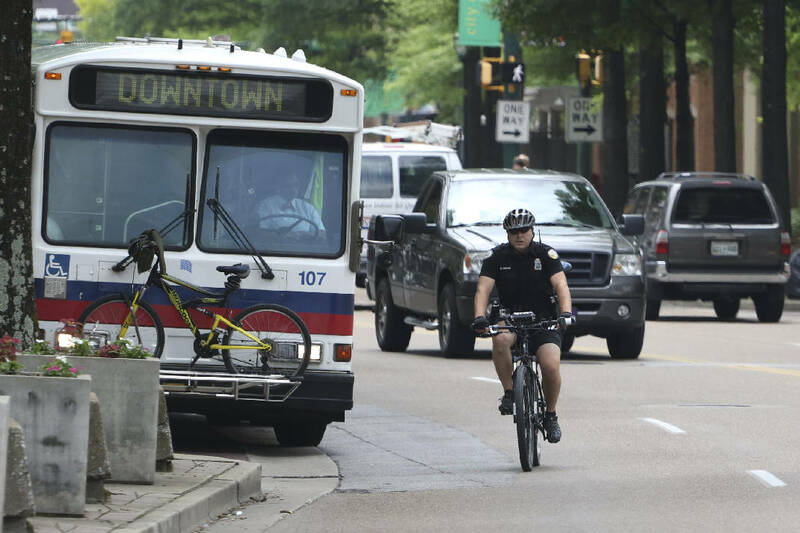 Chattanooga Police Officer Rob Simmons patrols Broad Street on June 3, 2015 while using a brand-new device attached to his bicycle that measures the distance motorists give when passing. "We've never had a data-driven device to measure that distance," Simmons says. "It's evidentiary, rather than an officer's opinion." BSMART (Bicyclist and Safe Monitoring Applied Radar Technology), made by Austin, Texas-based Codaxus, LLC, bounces ultrasonic waves off passing vehicles and calculates for distance. It's a brand-new technology, developed by friends of Chattanooga Police Chief Fred Fletcher. Chattanooga is the first city in the country, and possibly the world, using it. "We are proud to be the first users of this innovative technology," Fletcher said. "Our partners in Austin, Texas, worked for years to perfect this technology. The deployment of this technology in Chattanooga affirms our place as a technologically progressive city which includes the police department." Simmons is a 12-year CPD veteran who's been on bike patrol for seven. He said there have been almost 200 crashes involving motorists and cyclists in Hamilton County over the last five years, resulting in two deaths and 162 injuries. For Simmons, it was the 2009 death of David Meek, a 51-year-old father of two who was killed when a large truck clipped his saddle bag and threw him from his bike, that inspired him to try to fix the problem. "It really brought it home to me when he was killed," Simmons said. "The problem was motorists were unaware of the rights of these cyclists, and that they had to look out for cyclists." Since Simmons started using BSMART two weeks ago, he says he's been getting calls from police departments all over the United States expressing interest in the technology, as well as a cycling group in Great Britain. Codaxus founder Christopher Stanton said his company has four more BSMART devices in the pipeline for police departments in Houston and Austin, Texas, Kentucky, and elsewhere. 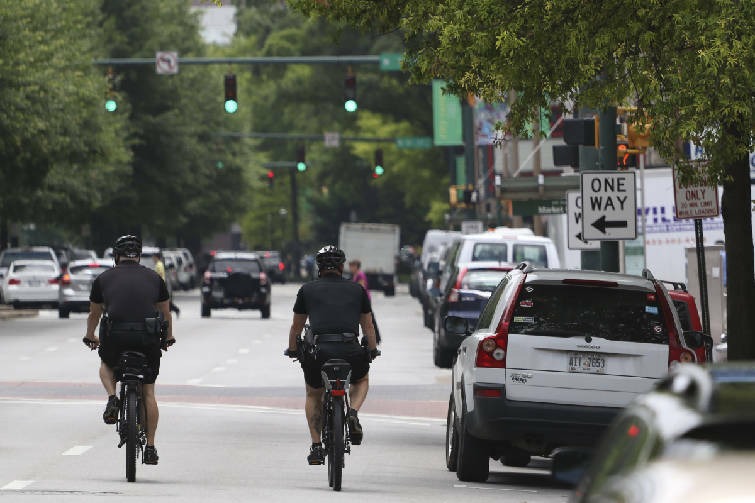 Chattanooga Police Officer Rob Simmons , right, and another officer patrol Broad Street on June 3, 2015 while using a brand-new device attached to Simmons' bicycle that measures the distance motorists give when passing. Simmons said nearly all of the seven or eight people he's stopped in the last two weeks have been grateful for the information about the three-foot law, particularly when he plays back the GoPro video showing the drivers what it felt like for him when they passed him. It's that kind of empathy that can change minds, Simmons says. "That's a success," Simmons says, "if I can change their behaviors." But some, even after hearing about the law, still don't think they did anything wrong. In those instances he may write a ticket, and a judge can send the violator to a 90-minute "Cycling 101" class with Outdoor Chattanooga. Contact Will Healey at whealey@timesfree press.com or 423-757-6731.